Workman Publishing Company, 9780761157472, 280pp. Kids want to do it. Parents want their kids to do it. Schools often require kids to do it. So do it: Do something and change the world. And here’s how, in a fist-in-the-air book for every young activist. Do Something! takes aim at the next generation of do-gooders. Written in a lively, in-your-face style, designed to be edgy and hip, it’s the kind of interactive, educational book every parent will feel good about giving because it shows kids how to get involved, in language they understand. It’s an idea-to-execution guide. Quizzes help readers pinpoint their “thing”—a cause that fires them up. Then come the tools that show how to get something done, whether it’s making a poster, raising money, sending around a petition, or enlisting friends. There are 33 action plans, touching on areas such as the environment, human rights, poverty, animal welfare, education, disaster relief—plus worksheets, facts, and outlines to help socially conscious kids create their own projects, and, for inspiration, profiles of DoSomething.org grant winners. 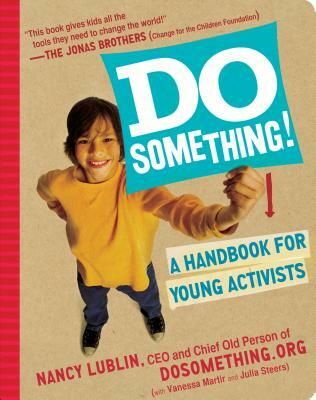 Additionally, DoSomething.org is setting up a separate website for this book’s readers. Vanessa Martir, formerly a content editor of DoSomething.org, graduated from Columbia University and is pursuing her dream of being a novelist, poet, and writing teacher. Her previous books include Woman's Cry. Nancy Lublin is the CEO and Chief Old Person of DoSomething.org. She is also the founder of Dress for Success, which she ran for 7 years. She graduated from Brown University, Oxford University, and NYU School of Law. She writes a popular column for Fast Company and teaches not-for-profit management at NYU and Yale School of Management. Julia Steers, formerly a content editor of DoSomething.org, graduated from Georgetown University and is currently social media manager at The Huffington Post.